Prominent & Leading Exporter from New Delhi, we offer adaclene gel. We offer an effective range of Adaclene Gel to customers. The offered medicines is used for the treatment of acne vulgaris. To keep its quality intact, our offered range should be stored at room temperature. Moreover, we pack it using tamper proof material to facilitate its safe transit at clients' destination. 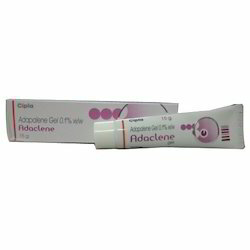 Adaclene Gel (Adapalene) is only to be used externally on the skin and must never be administered orally or otherwise ingested, as doing so is hazardous to your health. This gel should not be used on skin which is broken, affected by eczema, or otherwise irritated. You will need to allow these disorders or wounds to heal before commencing treatment. Treatment with this gel can cause the skin to be more vulnerable to the sun. Avoid sun exposure and tanning beds. Use sunscreen if going outdoors, and ensure that you properly protect yourself with long-sleeved clothing, a cap and sunglasses.